They came, they cooked, they ate! 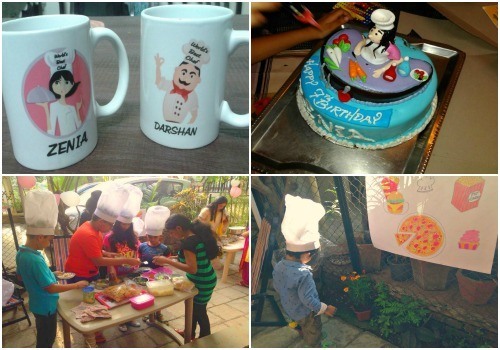 A delectable birthday party where guests made the food! What do you do when you’re invited to a party and are expected to make your own food? You don a chef’s hat and get down to business, of course! 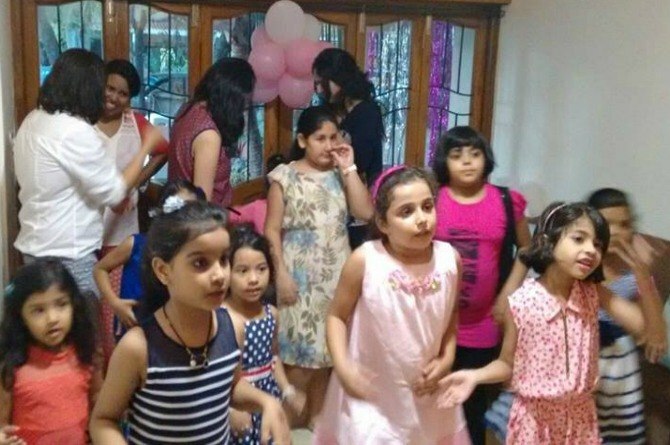 That’s exactly what little Zenia Jain’s guests did at her seventh birthday party. 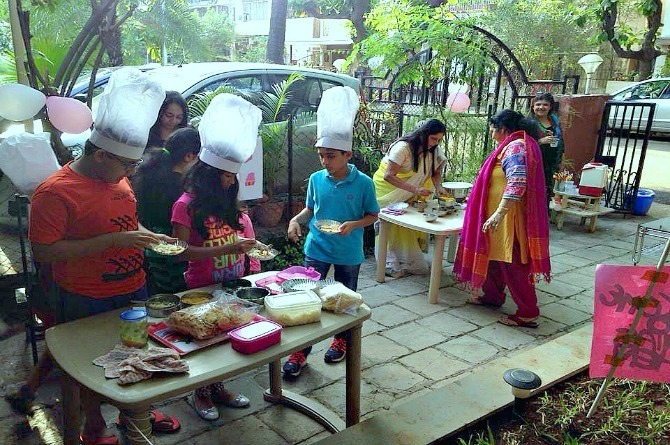 They came, showed off their culinary skills and had a finger-licking good time! 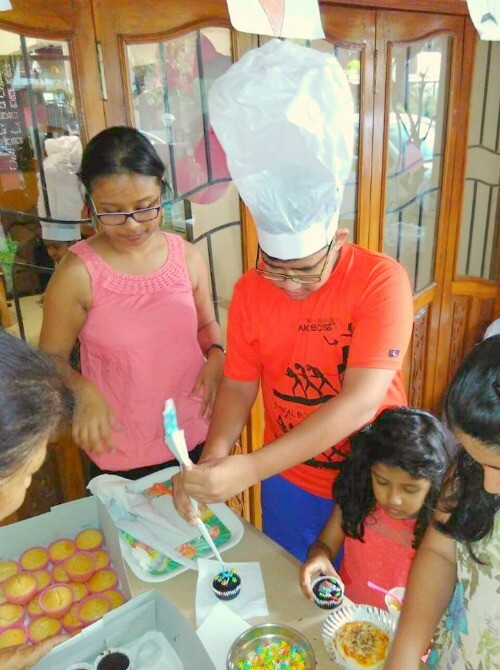 We think Zenia’s mom, Sugandh Jain, the brain behind this delicious party, is one smart woman! 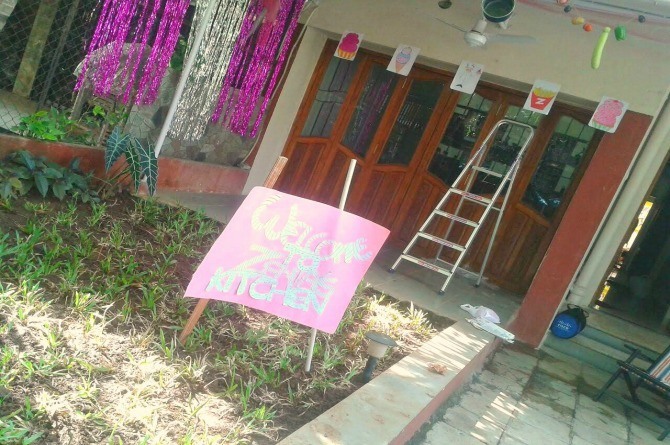 She managed to get a rocking party arranged in a short span of time without hiring a party planner! So, what was this party all about? Read on. 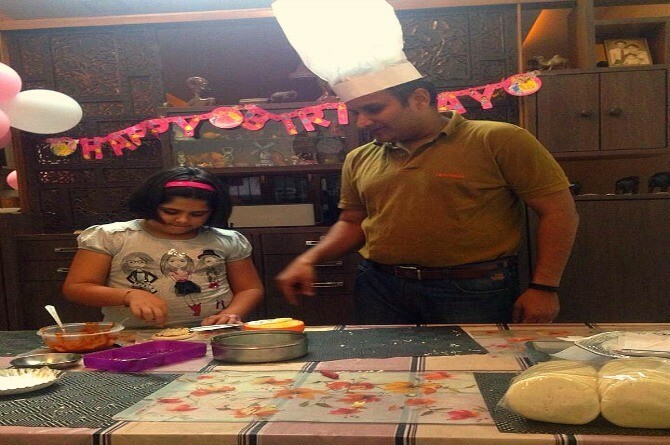 The young Masterchefs whipping up something yummy! The whole preparation took approximately three days. 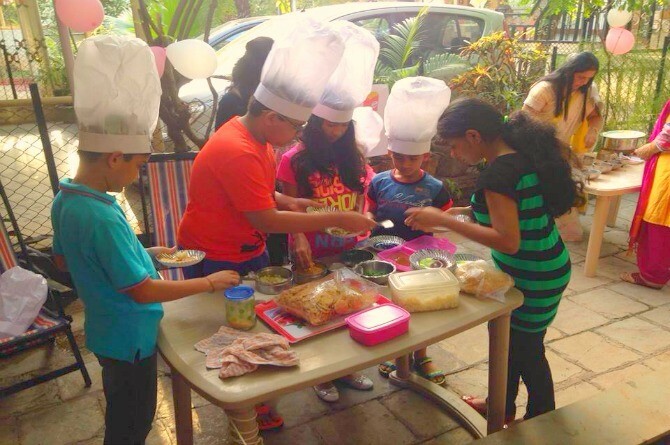 Sugandh wanted the kids to make dishes that involved no direct use of fire, yet were fun to prepare. After some brainstorming, she decided on a welcome drink, pizzas, sev puri, masala corn and cupcakes. “I made cute white chef’s hats for all the guests at the party and a pink one for the birthday girl. On the morning of the party, I set up the ‘mise en place’, that is arranging and organising all the ingredients for the dishes,” she shares. Continue reading to know details about the prep behind the great party! The decor included shiny streamers, kitchen pots and pans and veggies which were hung up to resemble a professional kitchen. “Some colourful charts were also put up. Those I got done by the kids at home,” she laughs. Tables of various sizes were also arranged at strategic points of the house. Each table held the ingredients required for that particular dish so that the young Masterchefs didn’t have to scamper around. There were large chart papers stuck at various corners of the venue with mouth-watering pictures of cupcakes, pizza, popcorn and much more. Speak of luring the young chefs into trying their hands in the kitchen! Continue reading for colourful details on the decor! We cook our food the way we like it! There wasn’t any dress code for this birthday party. Kids could wear whatever they were comfortable in. “We just requested the guests to wash their hands and wear the cap before they began the activity,” says Sugandh. Kids decide the fate of their pizzas! Each table had an adult to guide them through the ingredients available. Children made the dishes to suit their taste. “It was really surprising to see kids thoroughly enjoying the entire process. The joy of eating something they’ve prepared themselves was evident on their faces. At least now they will appreciate food and their mummy’s cooking more,” hopes Sugandh. We know to cook, we know to dance as well! Besides the cooking activity, the children had fun dancing to music that was playing in the background. An adult was responsible for overseeing the dance and actively involving all the kids. The guests could walk up to any stall at any time to make themselves a dish. 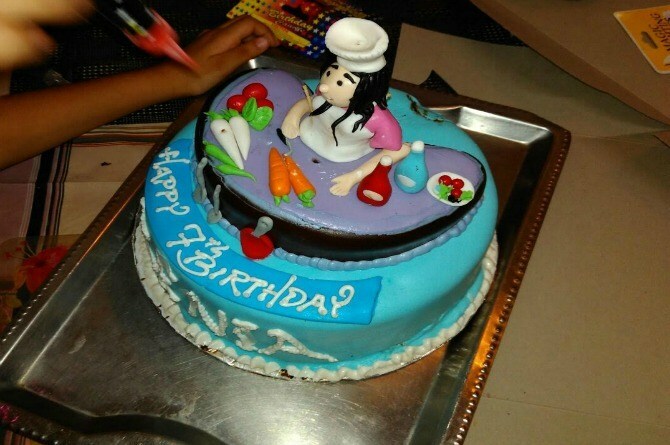 Awesome little masterchef birthday cake! The cake was a little Masterchef cake that resembled a cooking table laden with kitchen ingredients. It also had an edible figurine of a little girl in a chef’s hat. Waiting to cut the cake! 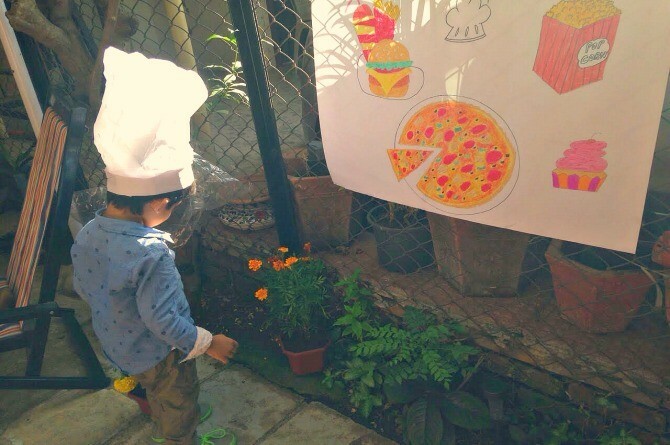 Since the party was all about food from start to finish, Sugandh did not arrange for any extra food for the guests. Zenia’s friends insisted on making the dishes for their own parents with much excitement. 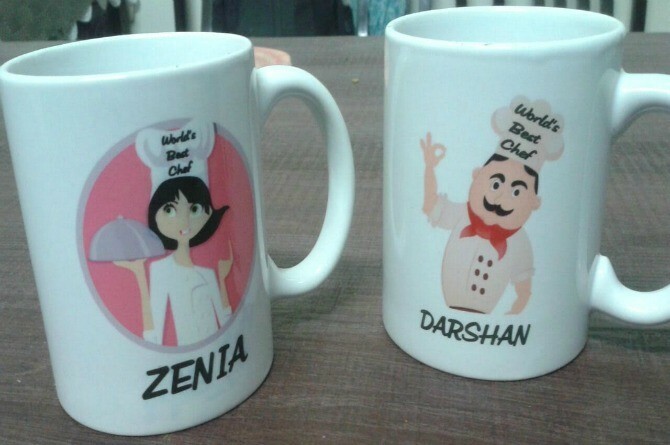 The return gifts were personalised mugs with a chef’s image and the words, ‘World’s best chef’, for each little guest. All the party material was sourced from local markets. 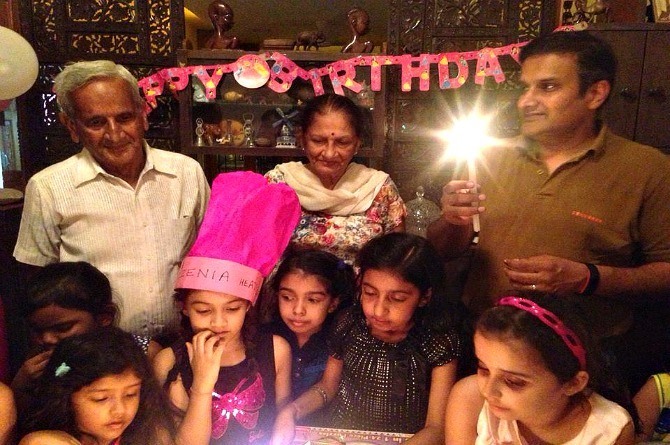 Birthday girl Zenia’s dress cost ₹ 1,500. Overall, Sugandh spent around ₹ 21,000 for the entire party. Our taste buds are more than satisfied with this delectable celebration. 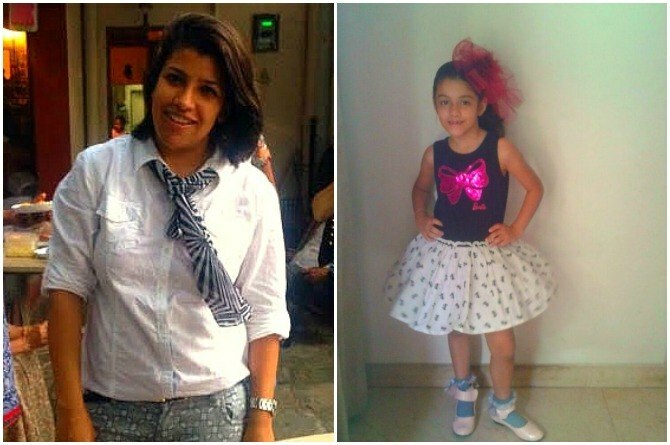 Smart mum Sugandh, we loved featuring you on our awesome birthday celebration ideas list! If you know any amazing birthday celebration ideas we could feature, drop us a comment in the box below!